Choosing the right plant for the right place is a key element to protecting California's rich natural ecosystems. When used appropriately, plants offer us nourishment, beauty, sanctuary, and habitat; but some plants may have adverse environmental consequences. Figure 1. Periwinkle (Vinca major) is a fastgrowing, competitive plant that forms dense mats of growth. Since 2005, PlantRight has worked with a diverse alliance of stakeholders to address the problem of horticultural plants that become invasive in California (Figure 1). Run by non-profit Sustainable Conservation, PlantRight tackles this important issue in a collaborative, voluntary, and science-based fashion, focusing on solutions that make environmental and economic sense. We first shared information on PlantRight's programs in the June 2012 issue of UC IPM's Retail Nursery and Garden Center News. We are pleased to give you an update on several developments that have happened since then. Revised Plant List: After a year-long review, PlantRight's plant list of suggested alternatives to known horticultural invasive plants has been updated for the second time. You can find the 2015 version online, with pictures and planting information. Retail Nursery Partnership: PlantRight is seeking to partner with retail nurseries across the state to promote environmentally responsible gardening. Stores pledge not to sell any invasive plants from PlantRight's list (10 species) and receive staff training, communications materials, and access to promotional signage and other promotional opportunities, all for free. More information is available online, including a full list of existing PlantRight partners. Continuing Education: A free continuing education module about invasive plants and the PlantRight program is now available online for avid gardeners, landscape professionals and those in the nursery trade. The program offers individuals with a range of existing knowledge an opportunity to contribute towards solutions to the problem posed by horticultural invasive plants. For instance, graduates can join PlantRight's new “Ambassador” program and gain access to resources for sharing this information with local nurseries, garden groups, and others. The process takes less than one hour to complete and has been approved for a CCN Pro CEU credit. Spring Nursery Survey: Thanks to the dedication of more than 120 UC Master Gardener volunteers last spring, PlantRight's 2014 survey was a huge success. Drawing from data collected at 226 stores in 35 counties across the state, PlantRight saw a decline in the availability of invasive plants from its original list, from around 30% between 2011 and 2013 down to 19% of stores surveyed in 2014. Figure 2. 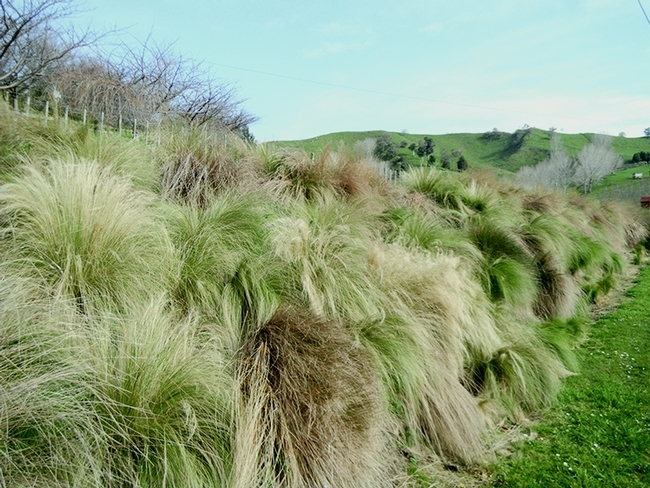 Mexican feathergrass (Nassella tenuissima) invading a hillside in New Zealand. 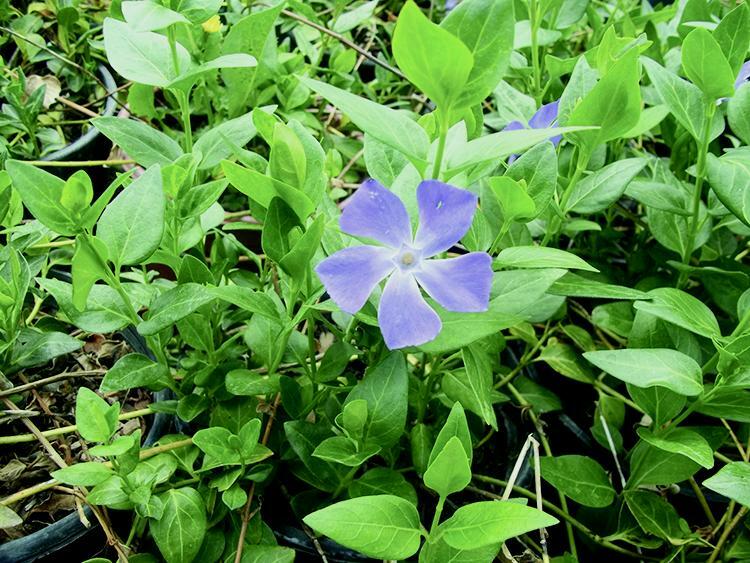 Driving this positive change was a large decrease in the availability of big leaf periwinkle (Vinca major), dropping from 17% between 2011 and 2013 to 9% of surveyed stores in 2014. However, the newly-listed emerging invasive Mexican feathergrass (Nassella tenuissima) (Figure 2) increased in prevalence from 27% in 2013 to 38% in 2014. A comprehensive report and simplified fact sheet detailing the results can be found on PlantRight's survey website. Please note that PlantRight works in partnership with the nursery industry and only releases aggregated data that protects the identity of, and data from, the stores that are surveyed. These results act as PlantRight's guiding light, shaping its strategy and helping it move forward collaboratively with the nursery industry. Visit the PlantRight website to learn more! Landscape designers should also be contacted. They continue to include Mexican feather grass in their designs. Great work PlantRight and MGs!!!!! !